Barry Roffman was born in Philadelphia, PA on May 22, 1947, graduated from Northeast High in 1965, and from Temple University in 1969. In December 1968, at the University of Pennsylvania, he earned his first commission in the U.S. Navy. Lieutenant Barry Steven Roffman served ten years in the Naval Reserve before being honorably discharged in 1979. He served on 5 aircraft carriers, 4 destroyers, an amphibious communications command ship, and a minesweeper. After active duty in the Navy, he taught science in Dade and Palm Beach Counties in Florida. In 1983 he enlisted in the Coast Guard Reserve as an E-5 (QM-2), and received another commission in 1985. He wrote readiness and disaster response plans for the Coast Guard and Navy for Coast Guard District 7 in Miami, Coast Guard Pacific Area in Alameda, California, and for Districts 14 in Hawaii and 17 in Alaska. These plans had earned him a Commendation medal, an Achievement Medal, and a Commandant’s Letter of Achievement Ribbon Bar with gold star in the early 1990s. He retired from the Coast Guard in 1995. In 2003 he was recalled from retirement, first to Coast Guard District Seven in Miami for 4 months, and then on to Coast Guard Pacific Area in Alameda, CA for three years. He retired again as the oldest Lieutenant in the Coast Guard on his 60th birthday on May 22, 2007. 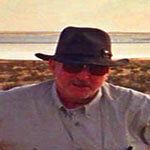 He has a great love for writing and research, and has authored three books. One published in 1978 dealt with comparative religion, the second in 1989 dealt with a custody battle, and the third book Ark Code, Searching for the Ark of the Covenant using ELS Maps from the Bible Code is currently for sale, at Amazon.com.